The International Association for Advancement of Space Safety (IAASS), sponsor of Space Safety Magazine, has signed a Memorandum of Understanding (MoU) with Space Generation Advisory Council (SGAC) to increase the scope and breadth of the collaboration between the two organizations. The MoU was signed by IAASS President Isabelle Rongier and SGAC Executive Director Minoo Rathnasabapathy. IAASS and SGAC have common interests in promoting space activities and strengthening the space sector’s workforce through career development, education and outreach. Both organisations are affiliated to the United Nations through the Committee on the Peaceful Uses of Outer Space. IAASS has supported SGAC in the past years by sponsoring students to participate in the annual IAASS Conferences and by supporting the SGAC Space Safety Working Group. Among the activities covered by the MoU, IAASS and SGAC will cooperate in organising outreach and awareness programs, joint conferences, projects and workshops. Both organisations will give the opportunity to qualified members to join the partner organization and will promote each other’s events. IAASS will keep supporting the Space Safety competition to by awarding SGAC members with scholarships to attend IAASS conferences. Finally, the IAASS will provide the opportunity to qualified SGAC members to become contributors to Space Safety Magazine. 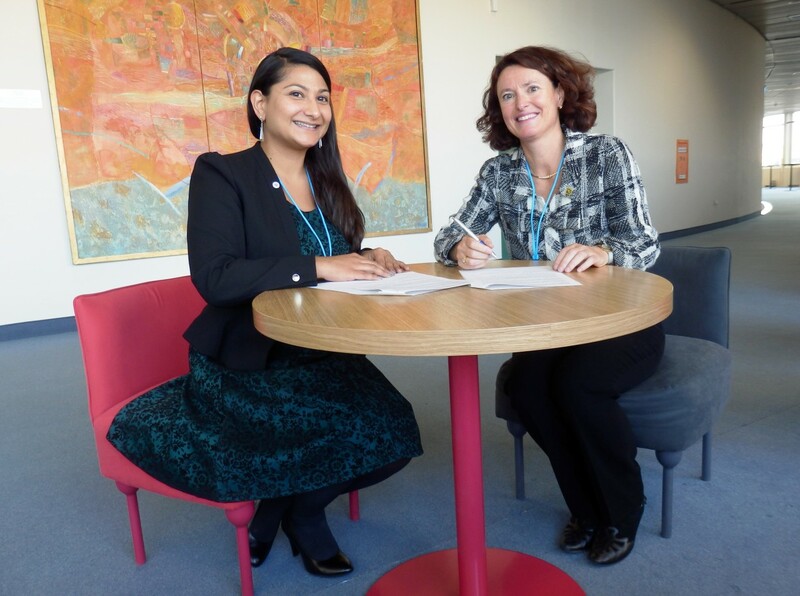 SGAC Executive Director Minoo Rathnasabapathy (left) and IAASS President Isabelle Rongier (right) sign the MoU. Space Generation Advisory Council is a non-profit organisation that represents students and young professionals in the space sector to the United Nations, States, agencies, industry, academia and other space sector organisations. The organisation’s focus is providing pragmatic space policy advice to policy makers based on the interests of its international network of university students and young professionals in the 18-35 age range. This constantly growin international network is the largest and most diverse of its kind. For more information, visit www.spacegeneration.org.